Grave Digger Classics in renewed splendor feat. Doro, Van Canto and Hansi Kürsch (Blind Guardian). First Orders will receive a FREE GRAVE DIGGER A 2 Poster. To mark their 30th anniversary, Grave Digger invited many guests onto their stage at the Wacken Open Air 2010 to join in the celebration. The amazing reaction of the fans and the outstanding chemistry of those involved led to "The Ballad of Mary". The 5-track MCD begins with the resilient and timeless "Rebellion" featuring Hansi Kürsch (Blind Guardian) and Van Canto in a supporting role. The performance of metal queen Doro and Van Canto bestow the beautiful "The Ballad of Mary" not only a fresh approach, but also newfound depth. The track ends on a longer and more symphonic note. 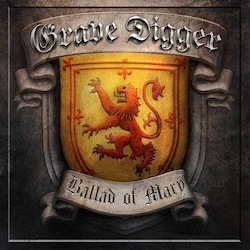 The final tracks, "Highland Farewell" and "Coming Home", glisten in their renewed instrumental splendor with additional choral arrangements that build up to an epic climax.